I am delighted to announce that Fishing Tails is extending its coverage area, with the addition of two new contributors. I am sure many people already know of them, the first is one of the countries most well known women anglers and top bait digger, Hazel Tipping who runs Hookers baits. 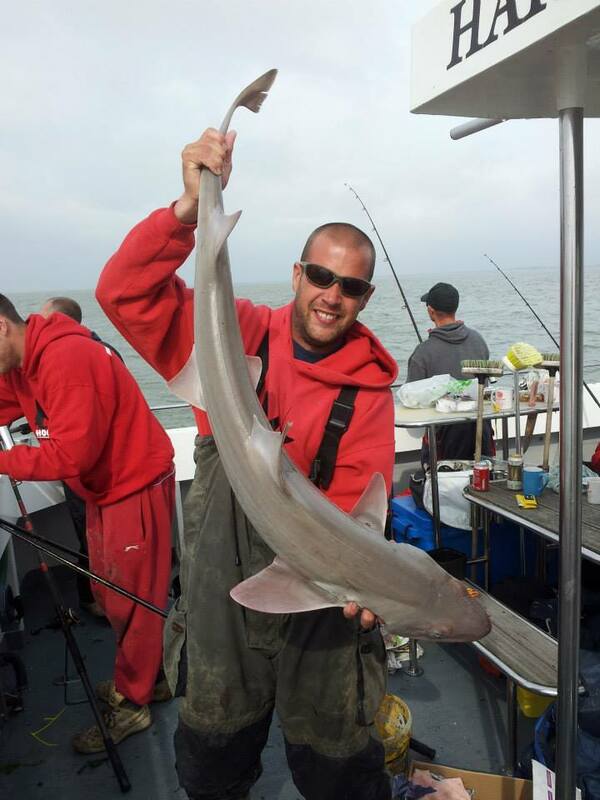 Our other new contributor, and the latest Fishing Tails guide, is former Sea Angler team fisherman Darren Mills. Darren will be co writing with Hazel to cover the Solent, and then extending to cover the Thames Estuary, Dungeness, Sheppy Island and the surrounding areas. Between Hazel and Darren we can expect a stream of great reports and articles. Hazel has promised us a number of articles on collecting and keeping bait. As owner of Hookers Bait, based on Hayling Island, she will be able to provide catch reports and forecasts for the days ahead. She will also have first hand knowledge of the latest tackle hitting the shelves. If there is an angler that knows how to catch fish on the South Coast it is Darren. His tales of numerous different species, and great days of fishing, have me desperate to travel to other areas of the coast to fish. 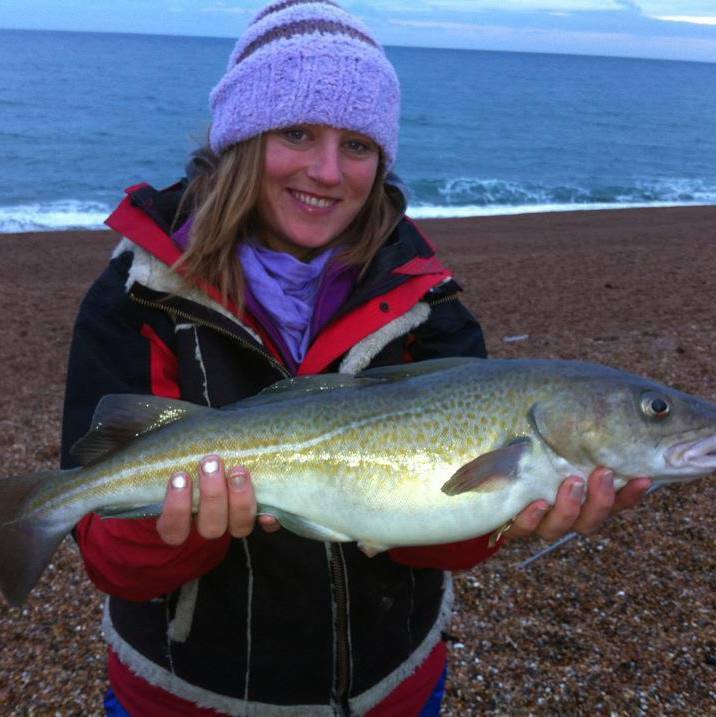 My first encounter with Darren was when I heard about one of the largest Cod caught on Chesil last year, which we featured in one of our reports. 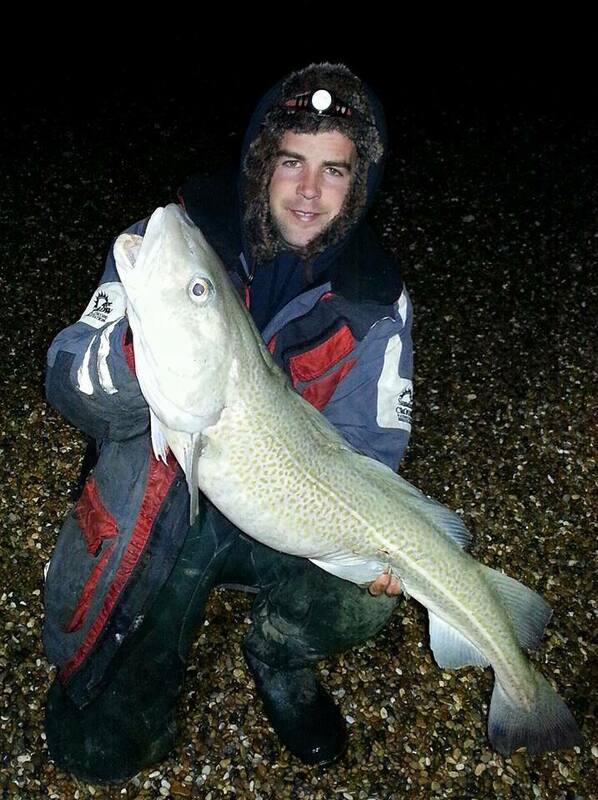 On his first visit to Chesil, he managed this 18lb dream fish pictured below. We will have more details about the areas and guiding that Darren will cover in the next week. I asked Hazel to give me some information about her background and how she came to be the owner of Hookers Baits, I hope you are as impressed with her story as I was. It was a bright sunny day on the mud flats of Morcambe Bay where I dug my first ever worm at the tender age of nine. I used to spend hours helping my Dad dig for bait, even skipping school to put on my wellies. All throughout my childhood, fishing and bait collecting was a huge part of our family life. My Dad ran a bait company called Neptune Sea Bait Supplies and I became a big part of the company as I grew up. When I left school we all moved from Morcambe Bay up to the Isle of Skye where I continued life as a bait collector helping my dad. I have dug worms for over 15 years now and I have travelled all over the UK digging many many beaches, even as far as Belgium for Lugworm and I have enjoyed every minute, except perhaps the night tides with headlamps and driving rain or hailstone. People don’t appreciate how hard it can be to dig bait. There are lots of key techniques you have to achieve in order to do well. As a professional bait digger I know the importance of back filling your hole in order for the ground to heal quicker and help new smaller bait to move into the area. Also it is only through experience that you can walk onto a new beach and know exactly where the worms will be, what the ground is like and how best to dig that area. Many people take for granted the sea and don’t appreciate the dangers such as soft quicksand, tidal movements and when you need to leave the beach in order to not be cut off. I have worked in the harshest weather conditions you could imagine and as I got older the hunger to earn money from my passion took over and I decided to try my hand at working on the local creel boats alongside the bait digging. The creel boats are no easy feat and it is extremely dangerous, I loved it. I decided to go ahead and gain the qualifications so that I could skipper my own creel boat instead of just being the crew, so I have now got several qualifications that allow me to do that, however, I have always come back to the fishing and the bait. Being a female fisherman is quite unique, I have a strong passion for fishing and particularly enjoy boat fishing. I have won several boat fishing competitions whilst living on the Isle of Skye too which I am extremely proud of. In 2011 I decided to take the plunge by myself and I opened Hookers Baits which is not only a mailorder company but a bait & tackle shop too. 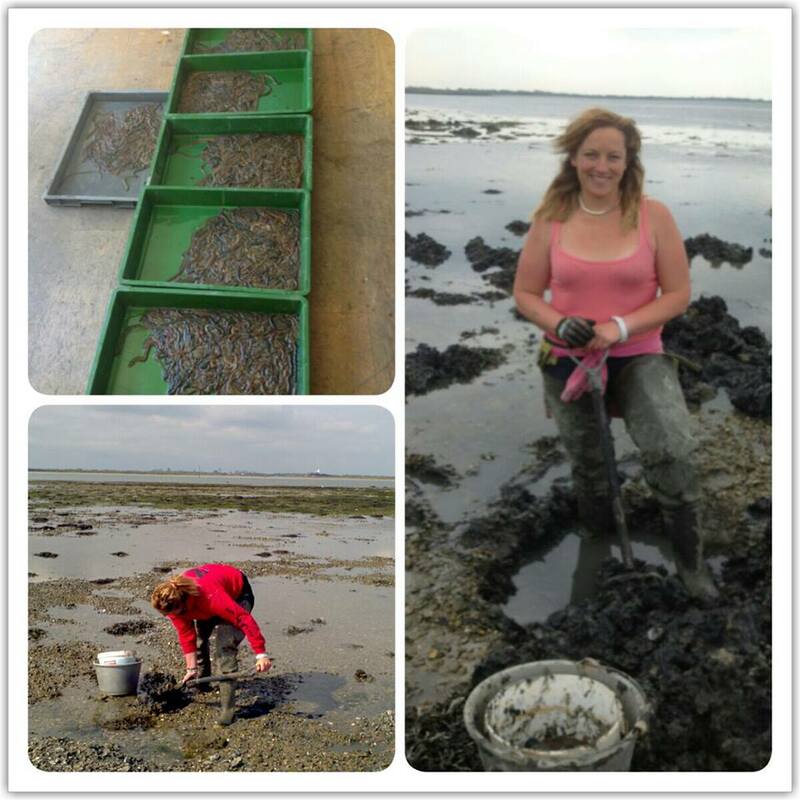 The idea behind my business was to supply top quality hand dug Ragworm, Lugworm, Maddies, White Rag and offer a vast selection of blast frozen sea baits to the general public via mailorder. The concept works well mainly due to the way in which I package my products. I use a combination of thick polystyrene boxes, newspaper and ice blocks to help keep the baits frozen for the 24 hour transport time. I particularly wanted my company to be all about the bait. Many tackle shop sell bait as a loss leader in order to push the tackle however, I have so much confidence in my products that my business is 75% bait and 25% tackle. A new concept in my area, one which many anglers didn’t think would succeed but so far I am proving them all wrong. It is hard being a female in a mans world however I have managed to slowly build my business to where it is now single handedly, whilst bringing up three young children alone, which is something I am really proud to be able to say. I started off fishing when I was 4 years old with my dad. We mainly fished the local rivers and lakes to begin with. The main reason I began to enjoy fishing was because of the challenge you face trying to actually catch something, never knowing what species you might catch. Seeing my dad regularly catch bigger fish than me inspired me to try to beat him. I began sea fishing around the age of 6, we fished the river Thames often from the shore, then within the same year I tried my hand at boat fishing in Dungeness targeting Cod which had me hooked. Over the years I have managed to gain experience in all aspects of both Coarse and Sea fishing, skills such as beach casting, rig making, specific species hunting, bait collecting and many others. Due to my commitment to my sport I have been successful in catching some fantastic fish and this has earned me not only my valuable reputation but I have also been featured in many fishing articles both within the UK and abroad. More recently I have enjoyed sharing my skills with others to help anglers improve their own sport, I get a huge satisfaction knowing that my knowledge and expertise can help someone to land that dream fish of a lifetime. 4 Responses to "Extending the fishing forecasts and new writers"
Wish them all the best,you have to experience what the diggers do in all weathers day and night to understand just how difficult it is to get bait. Great news, will look forward to reading both of your blog posts! ? Fantastic news to get Hazel on board. 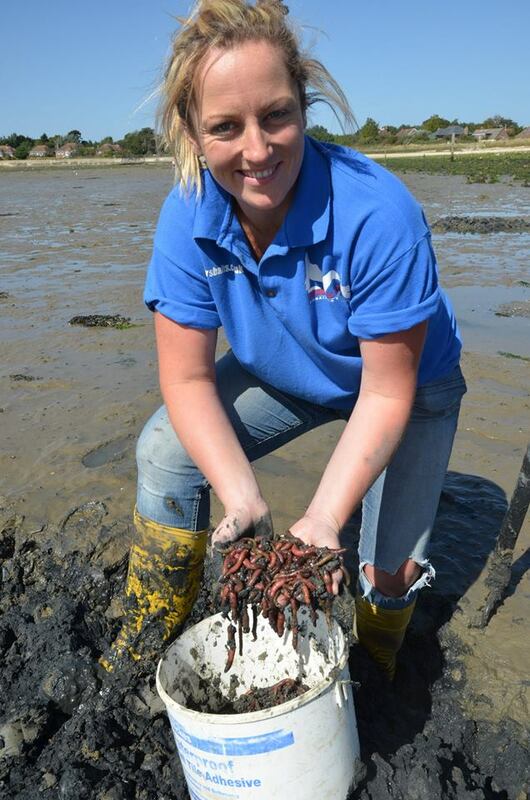 If her advice is as good as her bait then those Solent fish might not be as elusive after all. When you have to travel to the coast you can sometimes find yourself all alone on a beach fishing where the fish aren’t. This will help take the some of the hit and miss out of my Sea fishing. Can’t wait to read her first update……. All the best to your two new contributors. From the look of their C.V.s they will be valuable assets and it will be very useful to see reports and forecast for other areas as well as the ones already covered. I look forward to reading their first reports/forecast.